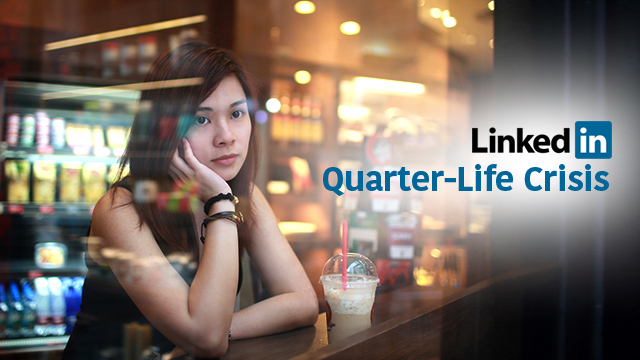 Are You One of the 87% of PH Millennial Professionals Experiencing a Quarter-Life Crisis? Around 87 percent of Filipino working professionals aged from 25 to 33 years old are currently experiencing a “quarter-life crisis,” according to a survey commissioned by professional networking website LinkedIn. LinkedIn defines quarter-life crisis as “a period in one’s mid 20s to early 30s marked by feelings of doubt and insecurity which can lead to anxiety or depression.” Taken on a global scale, the networking platform found that three out of four 25-to-33-year-olds experience the psychological phenomenon. Among young Filipino working professionals, LinkedIn found that a majority of them attribute their quarter-life crises to financial insecurity. “More than 60 percent find their quarter-life crisis marked by worries that they are not earning enough,” wrote LinkedIn in a press release issued April 23. As well, the survey found that respondents often linked their quarter-life crises to fear and uncertainty about their careers. Around 54 percent of respondents said that they felt unsure about their career prospects, while 53 percent mentioned that they were frustrated with the career options they currently have. LinkedIn added that 50 percent of the respondents said that they have a “dream job” in mind, but many of them attribute their quarter-life crises to their uncertainty in how to reach that goal. This is also fueled by their opinions of their current jobs, as 49 percent feel “stuck” in their present professions while 46 percent feel that they don’t get enough support from their job. However, LinkedIn revealed that many of these young Filipino working professionals are looking for advice to help overcome these worries, with 71 percent seeking advice on the next steps of their careers and 61 percent looking for specific career mentors. But these are not without issues, as most respondents reported that they do not know where to find these mentors or where to seek professional advice. To that end, LinkedIn is rolling out Career Advice, a new feature which allows users to connect more easily with other professionals in the platform depending on the type of advice they’re looking for. Career Advice will match advice seekers and advice givers based on both users’ profiles and preferences.